I got my first IBM style PC (as opposed to Commodore, Atari, Apple II) about 1990. A lot has improved since then; just about everything, in fact. With one glaring exception — the keyboard. 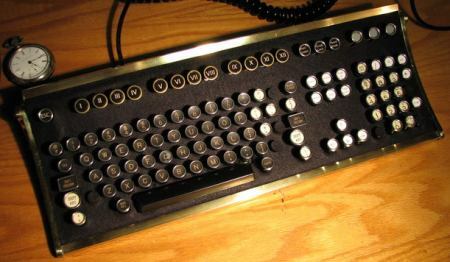 My first keyboard had 101 keys, no presumptuous “Windows” key (though back in those pre-Linux days the presumption would have been correct), and a firm “clicky” action which was rhythmic music to a touch typist’s ears. Over the years, as I upgraded and changed parts, my first keyboard came along for the ride. Today it is one of two parts of that original computer that I still have. The other is one of the last of the Radiation King monitors, a 14″ colour crt which refuses to die. I’m no longer using either of these parts day to day. By the time I reassigned the keyboard to server duty it had acquired an adapter for its AT-style connector, allowing it to be connected to the PS/2-style port. Now that computers are moving to USB, it will require an adapter to the adapter to be used on a modern computer. I replaced the old keyboard with another slightly less old keyboard, a genuine IBM Model M with PS/2 connector. My original keyboard was essentially a Taiwanese knock off of the Model M. It didn’t have a metal backplate, so it was quieter. The Model M, for all its clicky, built for combat, rat-a-tat goodness, is not the keyboard for those who like to type at 4 AM while their partners sleep in the next room. But if that’s not a problem, then it’s absolutely the right choice for any touch typist who learned to type prior to the age of ubiquitous cell phones, perhaps on one of the venerable IBM Selectrics. The Model M is a real keyboard. I did flirt briefly with the Happy Hacker Keyboard. It looks like they’ve been bought out by Fujitsu since then and suffered a slight name change. I also have an old Fujitsu keyboard with pretty good action that I’m hanging on to. Besides the noise, the primary downside of the Model M is that it is kind of ugly – one of those keyboards from a time when everything PC was some shade of beige. It also has, as most keyboards do still, a row of of seldom used function keys, and a complete number keypad. The Happy Hacker (or now, Happy Hacking Keyboard), on the other hand, was (is) beautifully compact, and came (comes) in black. Aesthetically very sweet. But sadly, the action is nowhere near as nice as the Model M.
The other day Slashdot posted a story about a keyboard mod which goes a very long way to eliminating the aesthetic limitations of the Model M. Check this out. When it comes to keyboards, new is seldom better. Give me the classics every time.